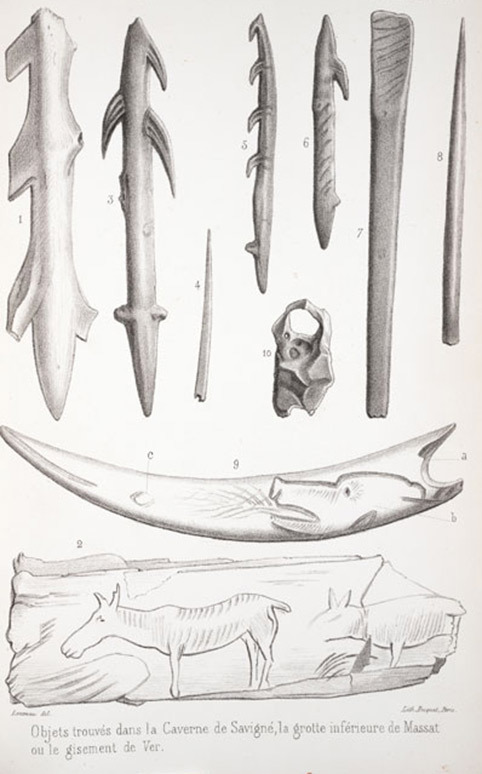 "Nouvelle recherches sur la coexistence de l'homme et des grands mammiferes fossils..." Annales des sciences naturelles, 4th ser., Zoologie et Paleontologie, 1861, 15:177-253. In 1852, a pair of would-be archaeologists, searching a cave in Chaffaud in west-central France, found a reindeer foot bone on which were engraved the images of two hinds, or female deer. A drawing was made that came to the attention of Edouard Lartet, who would soon become the greatest archaeologist in France and who had been investigating human bones and tools found in a cave in Aurignac, in southern France. 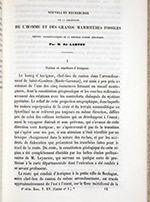 In this article on what would be soon be called the Aurignacian culture, Lartet published the drawing. It is the first image of a piece of Paleolithic carved art to appear in print, and it can be seen as the bottom figure on the displayed plate. The piece of engraved bone still survives and is on display in the Musée d'Archaeologie Nationale, St. Germaine-en-Laye, near Paris.